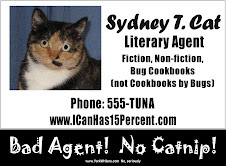 Sydney has been scooping up many writer's estates, and signing writers that is largely retired and is not keeping up with changes in publishing, offering to handle their back-lists. Scooping up like plump little mousies! Yum! Sydney knows how to sell words (especially good words written by professional writers) by the pound, turning them into cash! 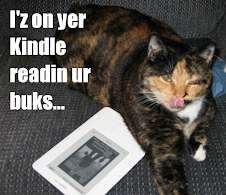 Sydney has her own publishing company on side. (Oh! Whoopses! Is just publishing company that is just happens to be BESIDE Sydney. Is not connected! Oh, no, oh noes!) Anyway, this almost certainly unconnected company publishes all these words as ebooks and print-on-demand books! Only a little bit, because company does not do very good job on conversions or formattings or covers, but does not matter, because Sydney works in bulk! Then, somehows (does not want to know how) bails of money fall into Sydney's mail-slot. KLUNK! There's anotherones! Oh, wait! What is this envelope here under bail of money? Oh, is from publisher trying to buy rights to one of Sydney's estate books! Sydney has dealt with these bad peoples before! Wants to offer estate much more moneys than Sydney's bulk deal. More money for estate, but LESS FOR SYDNEY! THIS CANNOT STAND! But do not worries! Sydney has easy solution! Just does not pass deal along! Tells publisher to go away! But this new letter, they is asking for contact information for estate, so can take offer to them directly. WELL, SYDNEY WILL NOT TELL! Will just keep estate in dark, and feed them -- well, you knows! Is good to me me!